The Pixar Times has been on an extended hiatus, mostly due to my personal/professional life ramping up over the course of the last few months. I do hope to return to posting regularly in the near future and will keep everyone updated on the status of that over on our Twitter account. In the meantime, I thought I would share some of the toys that I’ve been playing with and the books that I’ve been reading while I’ve been away from the site. In what should not be a surprise to anyone, this involves The Good Dinosaur and Toy Story products – take a look after the break! Pixar does dinosaurs! One of the most respected animation studios in the world tackling the world of dinosaurs should be enough to get you excited. If you have seen the film (don’t worry – no spoilers here), you saw that although the design of the world looks incredibly realistic the dinosaurs are heavily stylized. This toy, Galloping Butch, perfectly captures the look of the character in the film. You could leave it on the shelf because it looks so good, but he moves and roars too, an added bonus. By the name of the toy you may have guessed that it gallops, and you would be correct. There’s a button that makes it gallop just like in The Good Dinosaur, with the jaw opening and closing. 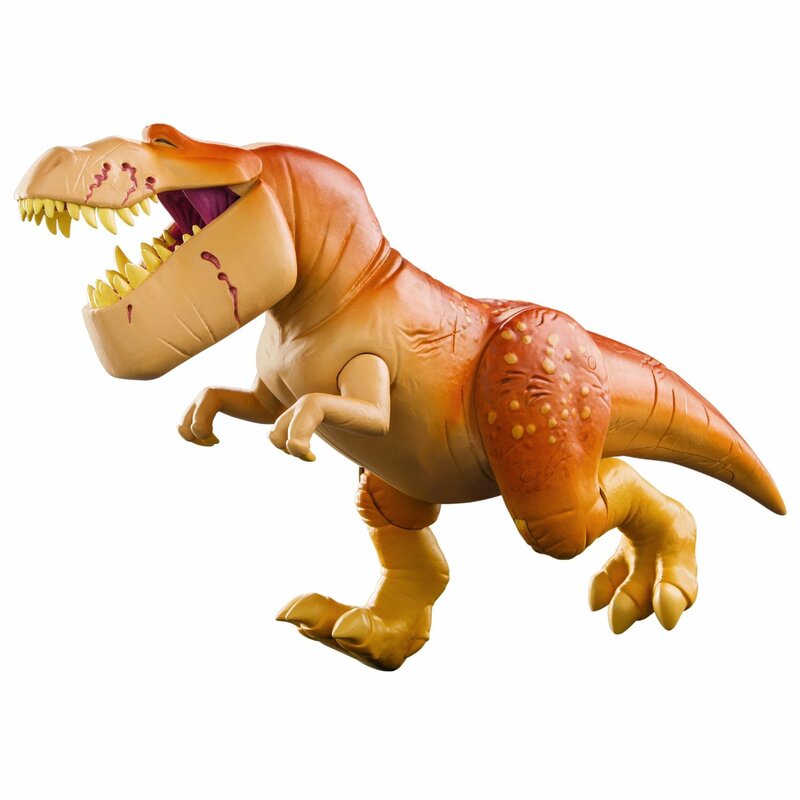 TOMY is the lead licensor of the toys for the film, and the company has done a sweet job at bringing the dinosaurs to life in toy-form. Priced at a reasonable $39.99 (suggested price, but you should be able to find it for cheaper), Galloping Butch is a good option for a toy to play with and/or collectible to own. 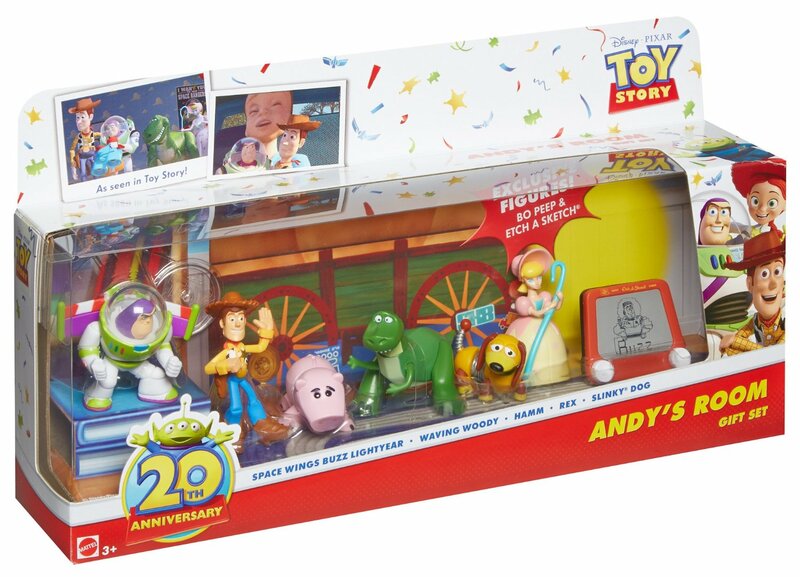 Toy Story celebrated its 20th Anniversary this year (sorry to make you feel older), bringing an awesome increase in the number of related toys and merch to stores. I enjoy collecting the Mattel “Buddies” line of toys because in one set, you get a whole line of figures. The Andy’s Room set features many of the main characters from the film series, including Woody and Buzz, and even has Bo Peep for those who missed her in the third film (she will return for Toy Story 4, though, so don’t miss her too much). A total of seven figures for $32.99 is a steal. We usually see the release of one or two art books from Chronicle, the great publisher that Pixar works with to give us a preview at some of the stunning artwork that comes about during the development process of the animated films. However, with two Pixar feature films being released into theaters in 2015, that number went up. Chronicle did not stop there – for the first time, we saw an entire art book for a Pixar short film. 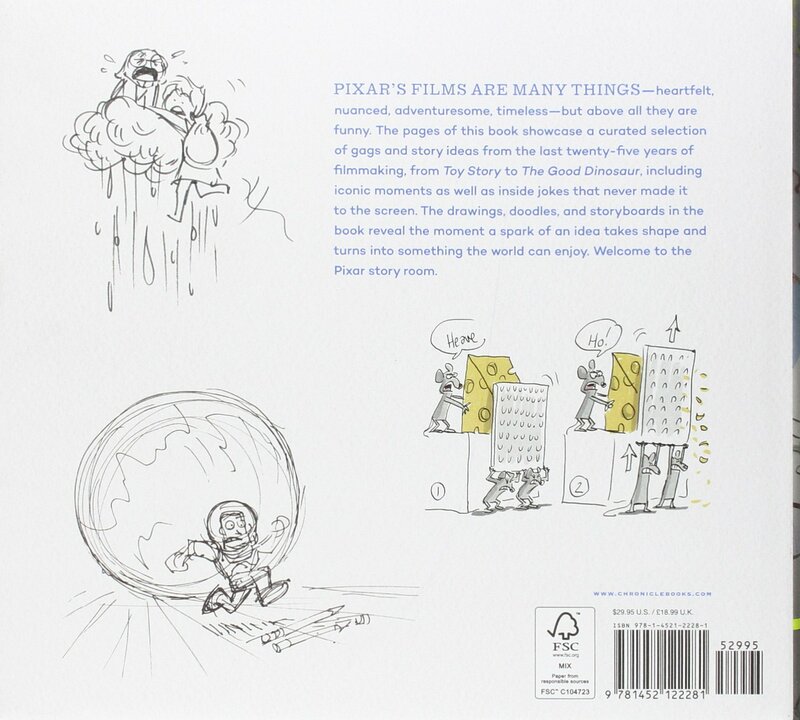 On top of that, a special book honoring the humor in Pixar’s story process was unleashed. Pixar films are well-known for having smart gags that appeal to the adults in the crowd. Imagine a book where you get to see many gags that didn’t make it into the films – here you go! Part celebration of the tons of storyboards Pixar’s artists put together to tell the story of the film in drawn form, and part peek into the hilarity of the story team, “Funny!” is a book that belongs in the library of every Pixar fan. One hopes that with the release of an art book for a short, we will see many more of these in the future. A Pixar short tends to be 7-minutes or less, but there is still a wealth of artwork created in the pre-production phase. 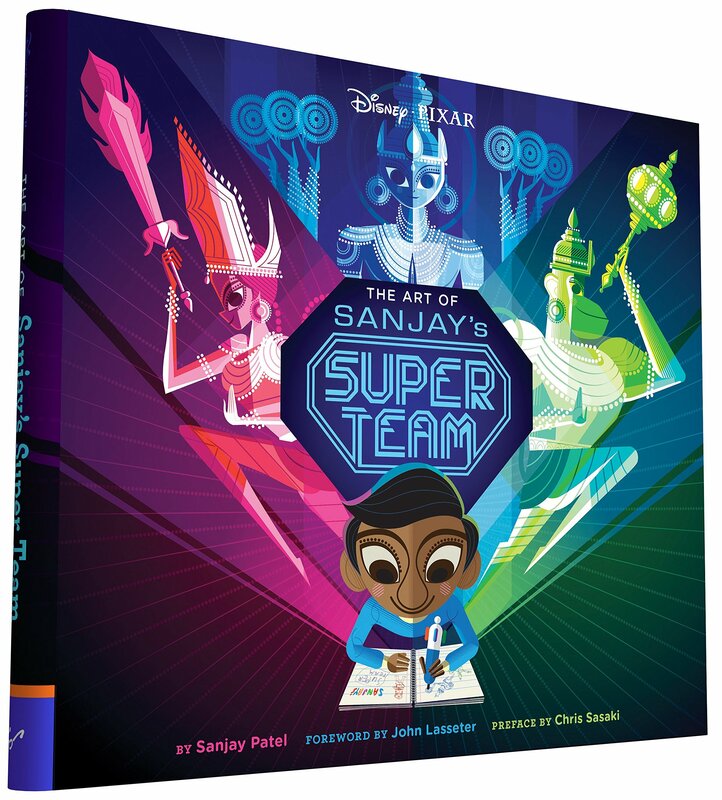 Sanjay’s Super Team is very-well one of Pixar’s more imaginative and personal shorts, and seeing how it came to be is fascinating. The book is smaller in all dimensions (it is dwarfed by the feature film art books), but contains art that deserves to be seen and owned. With us seeing two original films, Inside Out and The Good Dinosaur, this year, and Finding Dory coming to theaters next year, there will continue to be many great opportunities to own a piece of the films we enjoy. Happy Holidays, everyone!